Supporting small businesses by not paralleling the federal government in phasing out the benefit from the lower small business corporate income tax rate. Table A.4 lists the estimated budgetary impacts of these measures. Eligible child care expenses, defined as the tax filer’s total entitlement under the Child Care Expense Deduction. CARE tax credit recipients could also get tax relief from the Child Care Expense Deduction. Table A.2 shows examples of the average Ontario and federal Personal Income Tax relief from the Child Care Expense Deduction for families at a particular income. The average relief provided by the Child Care Expense Deduction generally increases with income (see Table A.2). As such, the Child Care Expense Deduction provides little or no support to tax filers with lower incomes. The Ontario CARE tax credit targets tax relief to these tax filers, filling the gap in child care support. See Chart 1.12 in Chapter 1 , Section C: Protecting What Matters Most . Table A.3 shows examples of the average combined federal and Ontario tax relief provided by the Child Care Expense Deduction and the Ontario CARE tax credit for families at a particular income. Federal and Ontario Personal Income Tax relief. For the 2019 and 2020 tax years, families would claim the proposed Ontario CARE tax credit on their tax returns. 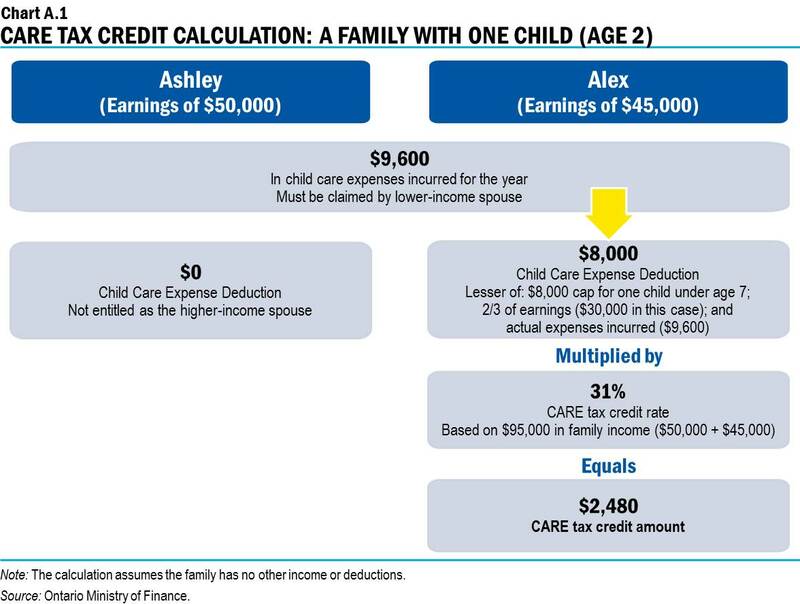 Families like Ashley and Alex (see Chart A.1) would use the same information required to claim their Child Care Expense Deduction to calculate their CARE tax credit. Starting with the 2021 tax year, Ontario intends to provide families with the choice to apply for regular advance payments throughout the year or receive a single payment when filing their tax returns after the year ends. Ontario will work with the Canada Revenue Agency and provide further details about advance payment delivery in time for the 2021 tax year implementation. The estate certificate gives proof of the estate representative’s legal authority to deal with the assets of the estate. An estate certificate is not always required to administer an estate. However, in situations where it is necessary to obtain a certificate, an application for the certificate must be made to the Ontario Superior Court of Justice. As part of the application process, an estate representative, such as a family member, must pay the Estate Administration Tax based on the value of the estate. Only estates that go through the estate certificate process are subject to Estate Administration Tax. As detailed in the examples in Chart 1.15 of Chapter 1, Section C: Protecting What Matters Most , this proposed change means that Jesse, as the representative for an estate valued at $35,000, and Issa, as the representative for an estate valued at $50,000, would no longer need to pay Estate Administration Tax on behalf of these estates. The calculation of Estate Administration Tax payable would be simplified, as shown in Chart A.2. The government will also propose clarifying legislative amendments to the Estate Administration Tax Act, 1998 related to refunds of overpayments of the Estate Administration Tax. In addition, the government intends to reduce the compliance burden of the tax. See Chapter 1, Section C: Protecting What Matters Most for more details. After the proposed rate change, Ontario would be the only jurisdiction in Canada to exempt estates valued at $50,000 or less from estate administration taxes or probate fees. (See Chart A.3). Given the industry growth in recent years, tax credit applications to Ontario Creates have increased. The backlog of tax credit applications to the agency has resulted in long wait times for tax credit certification, with some applications taking 19 months or longer for certification. The government will review the cultural media tax credit certification process to streamline administration, reduce the tax credit application backlog and help companies receive their tax credits faster. In 2009, Ontario introduced a permanent transfer tax exemption for transfers of electricity assets among publicly owned utilities in order to encourage municipalities to enter into consolidation transactions. A number of primarily public-to-public mergers have occurred in the sector since 2009. However, at present, there are about 60 municipal electricity utilities remaining in Ontario. Consolidation in the electricity distribution sector could lead to reduced electricity rates and improved services for electricity customers through innovation and efficiency gains. Private-sector expertise can play an important role in achieving these objectives. To encourage private-sector involvement in the Ontario electricity distribution sector, time-limited tax relief measures that had been scheduled to expire on December 31, 2018, were extended until December 31, 2022, as announced in the 2018 Ontario Economic Outlook and Fiscal Review . The extended relief includes a reduction of the transfer tax rate as well as an exemption for capital gains arising under the payments in lieu of taxes (PILs) deemed disposition rules. For transfers of assets by municipal electricity utilities with fewer than 30,000 customers, the transfer tax rate has been reduced from 33 per cent to zero per cent. For transfers by larger municipal electricity utilities, the transfer tax rate has been reduced from 33 per cent to 22 per cent. Ontario’s recent efforts to encourage consolidation through tax incentives have resulted in a modest number of proposed mergers. For this reason, the government will continue to review sector activity and will consider additional ways to promote efficiency and modernization of the electricity distribution sector in consultation with consumers and other stakeholders. Effective January 1, 2019, the non-refundable Low-income Individuals and Families Tax (LIFT) Credit provides up to $850 in Ontario Personal Income Tax relief to low-income Ontario taxpayers who have employment income, including those earning minimum wage. This credit was announced in the 2018 Ontario Economic Outlook and Fiscal Review . A tax filer who is a Canadian resident, lived in any province or territory at the beginning of 2019 and who lives in Ontario at the end of the year will be eligible for this credit. Spent more than six months in prison during the year. These measures are in place for assets acquired after November 20, 2018, and will be phased out from 2024 to 2027. The measures provide $3.8 billion in Ontario income tax relief over six years, including tax savings of $615 million in 2018–19 and $1,125 million in 2019–20. A provision anticipating the Ontario Job Creation Investment Incentive was built into the fiscal plan in the 2018 Ontario Economic Outlook and Fiscal Review . 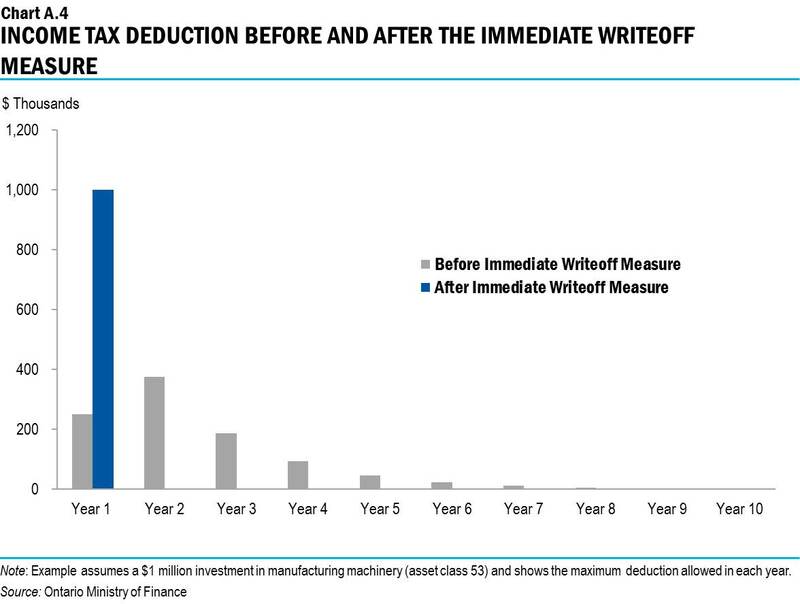 Chart A.4 shows the difference between annual income tax deductions under the former depreciation schedule and the immediate writeoff measure on a $1 million investment in manufacturing machinery. Under the former depreciation schedule, a business could annually deduct 50 per cent of the cost of manufacturing machinery for federal and Ontario income tax purposes (on a declining balance basis). In the first year the asset was put into use, the deduction was limited to half of the normal amount (i.e., 25 per cent). With the immediate writeoff measure, a business can deduct the full cost of the manufacturing machinery from its taxable income in the first year the machinery is put into use. 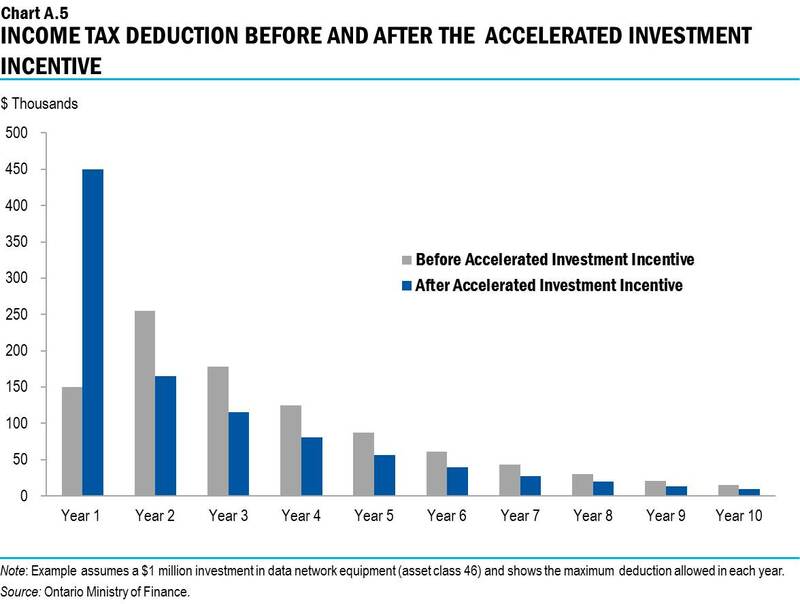 Chart A.5 shows the difference between annual income tax deductions under the former depreciation schedule and the Accelerated Investment Incentive on a $1 million investment in data network equipment (e.g., certain data servers, routers and modems). Under the former depreciation schedule, a business could annually deduct 30 per cent of the cost of data network equipment for federal and Ontario income tax purposes (on a declining balance basis). In the first year the asset was put into use, the deduction was limited to half of the normal amount (i.e., 15 per cent). With the Accelerated Investment Incentive, a business can deduct an amount equal to three times the former first year depreciation rate of 15 per cent, or 45 per cent, in the first year the equipment is put into use. In subsequent years, the normal 30 per cent depreciation rate applies. Ontario’s Government for the People is taking action to level the playing field for businesses by fighting tax evasion and avoidance. A fair and transparent tax system that discourages artificial transactions to avoid taxes will help Ontario compete for business investments and the resulting jobs. To find and address tax loopholes and abuse, the Province has created a specialized unit of tax experts who are working with federal and provincial tax officials. Table A.4 reflects the impact of tax measures on government revenue, unless otherwise indicated. “s“ indicates a small amount (less than $1 million). Measure includes Corporate and Personal Income Tax revenue impact. To improve administrative effectiveness or enforcement, maintain the integrity and equity of Ontario’s tax and revenue collection system, or to enhance legislative clarity or regulatory flexibility to preserve policy intent, amendments will be proposed to various statutes administered by the Ontario Minister of Finance. Amendments to the raw leaf tobacco provisions in the Tobacco Tax Act that would establish penalty and offence provisions related to: the use of new track and trace bale markers issued by the Ministry of Finance; and for failing to notify the Ministry of the destruction of raw leaf tobacco. Amendments would also remove “baling and packaging” from the definition of “producing” tobacco and require any raw leaf tobacco certificate to permit “baling and packaging”. Additional amendments would clarify provisions related to permits. Introduction of the Cannabis Taxation Coordination Act, 2019, which would ratify Ontario’s Coordinated Cannabis Taxation Agreement. Amendments to the Compensation for Victims of Crime Act (CVCA) to cap the amount that the Criminal Injuries Compensation Board (CICB) can pay out for pain and suffering at $5,000 and increase the maximum single payment amount for one victim from $25,000 to $30,000. Amendments would also provide for a cut-off date for new applications to the CICB (to be determined by the Lieutenant Governor in Council), after which time an enhanced victims’ financial assistance program would be offered by the Ministry of the Attorney General. Finally, the amendments would provide for the eventual dissolution of the CICB by regulation and repeal of the CVCA. The repeal of the Proceedings Against the Crown Act (PACA) and replacement with the Crown Liability and Proceedings Act, 2019 (CLPA). The CLPA would clarify the scope of the Crown’s civil liability and the procedural rules that apply in civil proceedings in which the Crown is a party. The CLPA would eliminate the procedural requirement that a plaintiff must obtain formal permission from the government to sue the government for claims arising before September 1, 1963. The CLPA would also provide that the Crown is not liable for negligence for certain legislative, regulatory or policy decisions, and that the Crown itself is not liable for torts committed by Crown agencies, Crown corporations, transfer payment recipients or independent contractors. In addition, the CLPA would provide that plaintiffs must obtain leave of the court before bringing a proceeding against the Crown for misfeasance or other tort claims based on bad faith. Amendments to the Education Act , to remove the right of school boards to have in-year deficits (unless approved by the Minister of Education) and replace it with authority to set out such a right in a regulation, and to remove the factors that the Minister is required to consider in approving a board’s in-year deficit and replace it with authority to set out such factors in a regulation. Amendment to the Education Act to align the authority of the Lieutenant Governor in Council to make regulations regarding First Nations representation on school boards with recently made amendments to the Act, establishing the new Reciprocal Education Approach. Amendments to the Fire Protection and Prevention Act, 1997 (FPPA) to strengthen and enable more effective and efficient enforcement of fire safety across Ontario. The amendments would extend the limitation period for initiating prosecutions of FPPA-related offences to provide fire departments with additional time to initiate prosecutions. The amendments would also expand cost recovery provisions to enable fire departments to recover costs for expenses incurred in closing buildings when approved by the Fire Marshal for the immediate protection of persons and property. This change is intended to reduce cost-related barriers fire departments may currently face. Finally, the amendments would increase maximum fines under the FPPA for most offences and establish subsequent offences with higher maximum fines to provide stronger deterrence and better align fines with the severity of fire-related offences in the Act. Amendments to the Pension Benefits Act to clarify the operation of the rules regarding contribution holidays. Introduction of the Tribunal Adjudicative Records Act, 2019 to establish clear and consistent rules for adjudicative tribunals in providing third-party access to their adjudicative records. Amendments to the Gasoline Tax Act to clarify that the regulation making authorities in the Act authorize prescribing requirements for on-reserve retailers in the gasoline tax refund process on sales to First Nation consumers. Amendments to the Public Transportation and Highway Improvement Act, to authorize the Minister of Transportation to appoint inspectors for the purpose of inspecting, auditing, examining, assessing and evaluating transit infrastructure assets held by or on behalf of the Toronto Transit Commission (TTC) or the City of Toronto. Where the City or TTC is not complying with an inspector’s request, the Minister of Transportation may apply to the Superior Court of Justice for an order directing the City or TTC to comply. This flowchart shows the steps required to calculate the Ontario CARE tax credit for an example couple with one child age two. Top level, left: Ashley is the higher-income spouse, with earnings of $50,000. Top level, right: Alex is the lower-income spouse, with earnings of $45,000. Second level (from the top): the couple has incurred $9,600 in child care expenses for the year. These expenses must be claimed by the lower-income spouse. Third level, left: As the higher-income spouse, Ashley is not entitled to the Child Care Expense Deduction and receives no tax relief from the CARE tax credit. Third level, right: Alex claims $8,000 for the Child Care Expense Deduction, calculated as the lesser of the $8,000 cap for one child under age seven; two-thirds of earnings ($30,000 in this case); and actual expenses incurred ($9,600). Fourth level, right: The Child Care Expense Deduction Alex claims is multiplied by Alex’s CARE tax credit rate (in this case, 31 per cent, based on $95,000 in family income, calculated as Ashley’s income of $50,000 plus Alex’s income of $45,000). Bottom level, right: This section shows the CARE tax credit amount resulting from the calculation immediately above, which equals $2,480. Note: This example assumes the family has no other income or deductions. 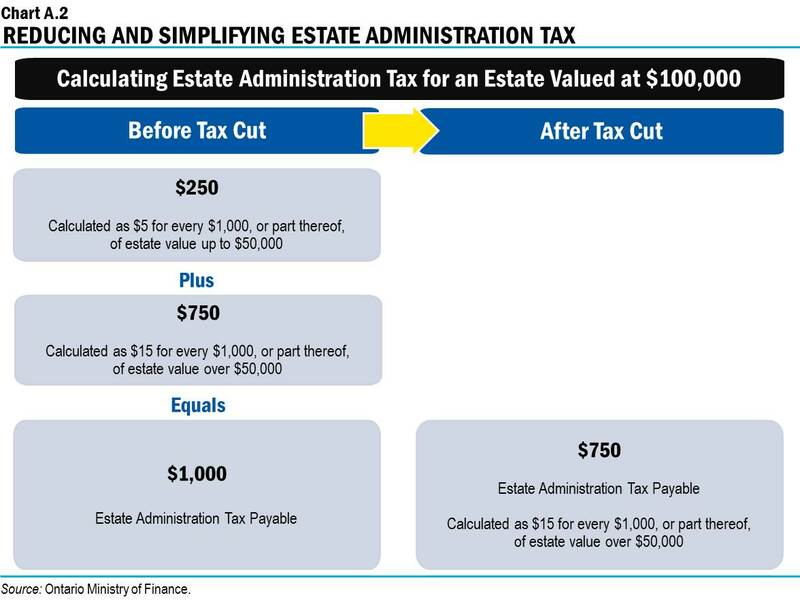 This chart compares the calculation of Estate Administration Tax before the proposed Estate Administration Tax cut to the simplified calculation after the proposed tax cut. The chart uses the example of a taxable estate valued at $100,000. The calculation of Estate Administration Tax before the proposed tax cut is shown on the left, and the calculation of Estate Administration Tax after the proposed tax cut is shown on the right. Left section: Before the proposed tax cut, Estate Administration Tax on a taxable estate valued at $100,000 is equal to $250 (calculated as $5 for every $1,000, or part thereof, of estate value up to $50,000) plus $750 (calculated as $15 for every $1,000, or part thereof, of estate value over $50,000). The sum of these amounts equals $1,000 in Estate Administration Tax payable. Right section: After the proposed tax cut, the Estate Administration Tax on a taxable estate valued at $100,000 would simply be calculated as $15 for every $1,000, or part thereof, of estate value over $50,000, for a total Estate Administration Tax payable of $750. 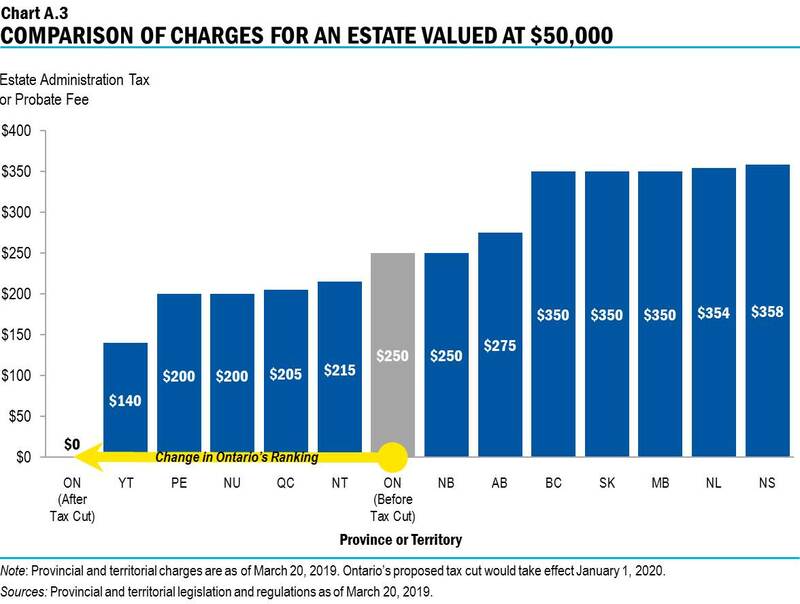 This bar chart compares the amount of estate administration taxes and probate fees that estate representatives would be required to pay on behalf of a $50,000 estate in all provinces and territories, including Ontario, before and after the proposed Estate Administration Tax cut. A $50,000 estate would pay $0 in Ontario under the proposed Estate Administration Tax rates, $140 in Yukon Territory, $200 in Prince Edward Island, $200 in Nunavut, $205 in Quebec, $215 in the Northwest Territories, $250 in Ontario under the current Estate Administration Tax rates, $250 in New Brunswick, $275 in Alberta, $350 in British Columbia, $350 in Saskatchewan, $350 in Manitoba, $354 in Newfoundland, and $358 in Nova Scotia. A yellow arrow in the bar chart illustrates that Ontario’s interjurisdictional rank for estate administration taxes or probate fees on a $50,000 estate would fall to the lowest among provinces and territories after the proposed rate change. Note: Provincial and territorial changes, and Ontario’s rate before the proposed tax cut, are as of March 20, 2019. Ontario’s proposed tax cut would take effect January 2020. The bar chart provides a 10-year comparison of the annual income tax deductions allowed for depreciation before and after the immediate writeoff measure came into effect. The example is based on a $1 million investment in manufacturing machinery (asset class 53), and shows the maximum deduction allowed in each year. The first set of bars shows that, under the former depreciation schedule, before the immediate writeoff measure came into effect, a business could deduct $250,000 (25 per cent of the $1 million cost of the machinery) in computing its taxable income in the first year the asset is put into use. In each of the following years, the bars show that 50 per cent of the remaining balance from the previous year could be deducted. The second set of bars shows that after the immediate writeoff measure came into effect, a business can deduct the full $1 million cost of the machinery in computing its taxable income in the first year the asset is put into use. In the following years, no further income tax deductions are available. The bar chart provides a 10-year comparison of the annual income tax deductions allowed for depreciation before and after the Accelerated Investment Incentive came into effect. The example is based on a $1 million investment in data network equipment (asset class 46), and shows the maximum deduction allowed in each year. The first set of bars shows that under the former depreciation schedule, before the Accelerated Investment Incentive came into effect, a business could deduct $150,000 (15 per cent of the $1 million cost of the equipment) in computing its taxable income in the first year the asset is put into use. The second set of bars shows that after the Accelerated Investment Incentive came into effect, a business can deduct $450,000 (45 per cent of the $1 million cost of the equipment) in computing its taxable income in the first year the asset is put into use. In the following years, the income tax deductions under the former depreciation schedule would have been larger than the income tax deductions after the Accelerated Investment Incentive came into effect. This occurs because the same 30 per cent depreciation rate applies on a larger remaining balance under the former depreciation schedule compared to the Accelerated Investment Incentive. For example, in year two, the remaining balance available for depreciation would be $850,000 under the former depreciation schedule and $550,000 under the Accelerated Investment Incentive.